Here's a splendid shot taken by one of our readers, Mario, from Italy. Classic Cycle Chic rolling past the vintage sign for the Tivoli amusement park. The park opened in 1843 and is a main tourist attraction. Walt Disney visited in the 1940's and was instantly inspired to go home and build Disneyland. 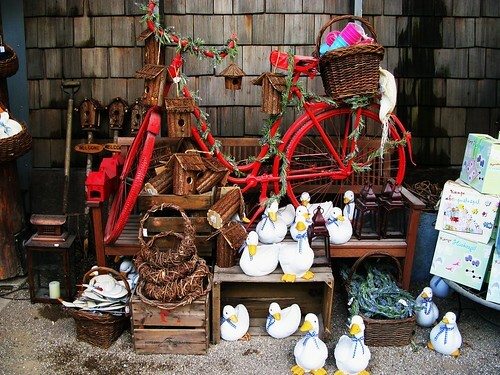 Here's a photo from inside during the Christmas fair. A classic bicycle used in a display. 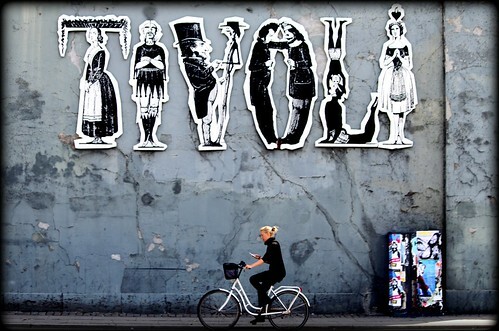 For some more photos of Tivoli sans bicyclette, click here. See that is "your" Tivoli - now Mario has to go home and take cycle chic pics at the original Tivoli, near Rome. I love the shot, with the woman in black on her white bicycle in front of the black and white vintage sign.